After being stuck in the making for a long time, Courier Boy Kalyan is up for release this Thursday. 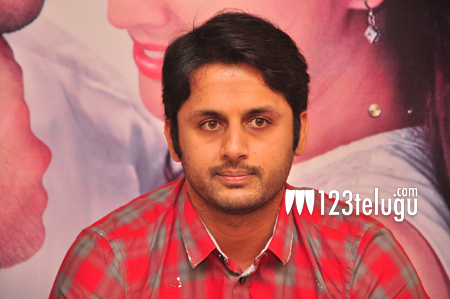 On this occasion, we caught up with hero Nithin for a detailed interview. Let’s see what he has to say. Q) Tell us about Courier Boy Kalyan ? After doing some romantic entertainers, I have tried something new for the very first time in my career. The concept of the film is quite unique and I feel that if the audience connect to the story line, they will enjoy this film thoroughly. Q) Are you tensed about the film’s release ? Initially, I was very confident but now I am a bit tensed. Off late, only commercial films have been doing well and our film has a unique concept. I hope and pray that the audience will like my attempt as the success of the film will give me enough courage to try out new things. Q) Tell us about your producer Gautham Menon ? Credit should go to him for going through all the troubles to release the film. Even though the film was delayed for a long time, Gautam never compromised on the quality and stuck to the content of the film. Q) Don’t you feel that you should have done the Tamil version too ? No ! The film was initially okayed by Jai and then the makers offered the role to many stars. Many of them rejected the film and I accepted it finally. Only time will tell if my prediction is right or wrong. Q) Why was this film delayed for so long ? I started working on the film after Ishq and completed my part of the shoot a long time back. As the Tamil version had financial problems, the Telugu version had to take a back seat. Q) Tell us about the director Prem Sai ? I should thank Prem Sai for bringing the film to me. He has done a wonderful job with the script and I hope all my fans will like my attempt. Q) How is Akhil’s film shaping up ? The film has shaped up quite well. Vinayak garu is working hard to give the best launch to Akhil. It will be a typical commercial entertainer in Vinyak’s trade mark style. Q) Reports reveal that Pawan Kalyan will attend Akhil’s audio ? Nothing is confirmed as of yet as the guest list is yet to be prepared. Q) Will you produce more films in the future ? I have given everything for Akhil’s film and trust me production is a very tough job. After a small break, I will take production if anything interesting comes up. Q) How is Trivikram’s film going to be ? It is an out and out love story in true Trivikram style. After hearing the story, I am very confident about the film’s success. I will be doing a bilingual in the direction of Gautam Menon which will go on floors in January.